With its sumptuous décor, 1920s-era architecture and opulent amenities, Four Seasons Hotel George V, Paris is one of the most elegant stays in the city. Its Le Spa is equally as extravagant, with a bright, modern and sophisticated look and unique services. After a two-year renovation, the spa reemerged in 2018 as a marble-clad space featuring five treatment rooms, a Technogym-outfitted gym, a 55-foot pool and two hammams. Designed by Pierre-Yves Rochon, it blends Greco-Roman influences with arabesque touches and is filled with the flower arrangements for which the hotel is justly famed. Facials are the treatment of choice here. The haute spa incorporates products from the top international brands to deliver non-invasive, results-driven skin services. For example, the Kobido is a Japanese tradition that dates back to 1472. Used by imperials and nobility, the facial stimulates lymph flow and microcirculation and is exclusively available at Le Spa. The pool is grand. It’s long enough for laps and surrounded by plenty of space to recline and relax in the privacy of a hooded lounger. Each changing room has its own hammam complete with an ice fountain — perfect for plunging your hands into after the sweltering heat of the steam room. 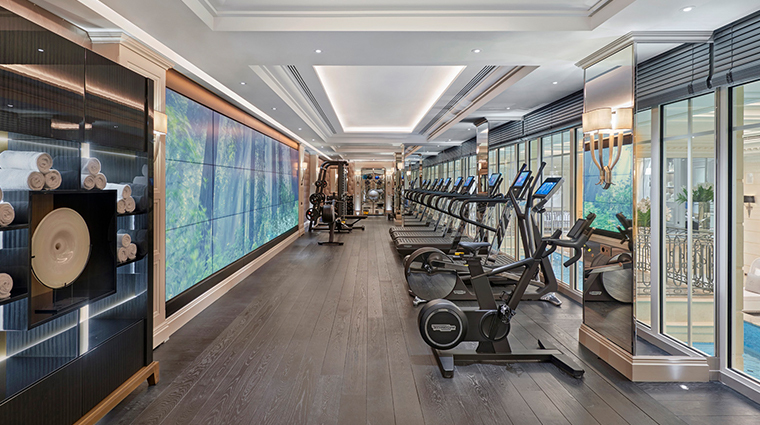 The fitness center devotes an entire wall to a vast screen that loops gorgeous scenes of nature from around the world, providing great inspiration for your workout. 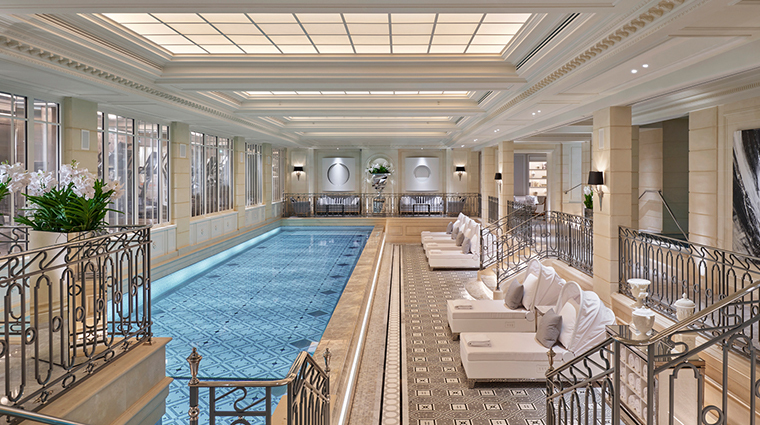 The Paris spa boasts a vitality pool heated to 86 degrees Fahrenheit. 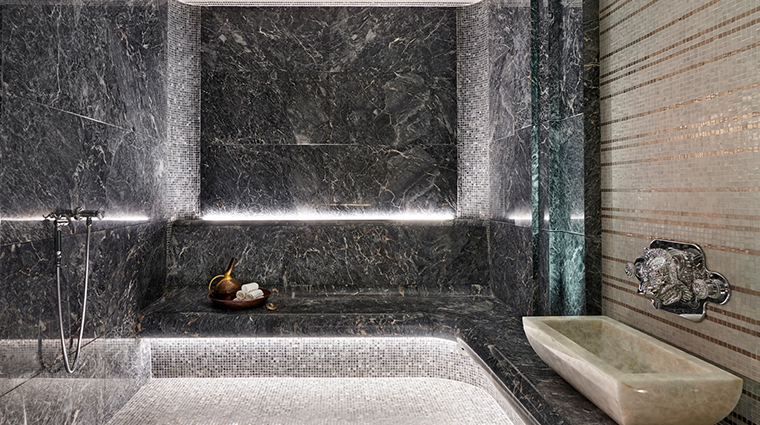 This is an ideal spot for a restorative soak after a long flight. The spa offerings are haute de gamme, a collection of rarefied beauty rituals and relaxation treatments that will spoil the senses. Be sure to book your treatment ahead of time or call to discuss services as soon as you check in — the intimate facility only offers five treatment rooms and one Spa Suite for couples. The Golden Triangle spa is open until 10 p.m. However, you can also enjoy massages and facials in your room 24-hours a day — useful for those arriving on a late flight. Four Seasons Hotel George V is famed for its lavish flower displays, the work of American designer Jeff Leatham, who creates a new floral theme each week. Peek at his creations throughout the hotel, including Le Spa. The Eighth Arrondissement spa is one of the only locations in Europe to offer Kobido facials, a practice that dates back to 15th-century Japan and focuses on facial-muscle toning. The results are said to be similar to a non-invasive facelift. Le Spa features three product lines, including Dr. Burgener, a high-end Swiss brand that specializes in using extra-luxurious ingredients, such as caviar and chardonnay grapes. Other products are supplied by Alaena, an organic French cosmetics line that focuses on holistic treatments that give immediate results. Have the Camellia Ritual massage for a taste. For a slice of ethereal bliss, try the George V Escape, a full-body ritual that features a chardonnay scrub, a champagne massage and an anti-oxidant-rich facial using green caviar and gold. The service culminates with a glass of champagne and a fresh macaron from the hotel’s pastry chef. 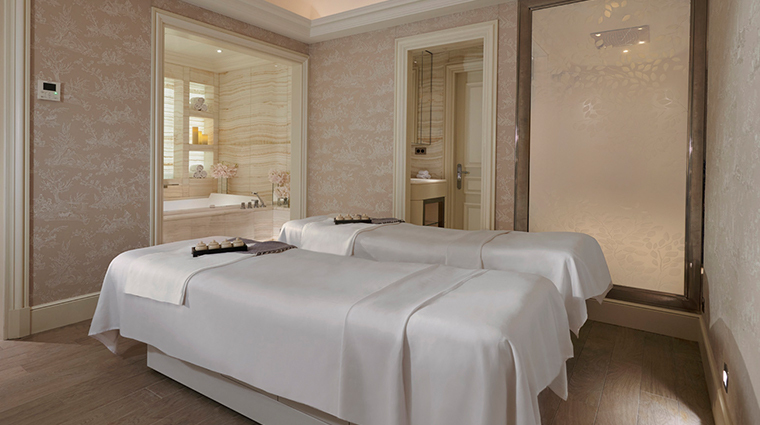 To add a little romance to your stay, reserve a treatment for two in the Spa Suite. The soothing space offers side-by-side massage tables, a bathroom and a unique duo bathtub. Le Spa’s small hair salon has a full array of services, including hair extensions, keratin straightening and styling for special events. Further grooming is available from makeup professionals and manicurists, and there’s also a waxing service. All these treatments are also available in-room. Personal trainers are on call for the 970-square-foot fitness center, providing different goal-oriented regimes: weight loss, toning, muscle building, core stability, mother-to-be and workouts for seniors.